Virtual currencies are set to be at the heart of an ambitious scheme to bring solar power to parts of Europe. In what is claimed to be a world first, the currencies are being used to encourage the switch to renewable power. A pilot project in Moldova is set to launch in September. If it is a success, similar schemes could be rolled out in Romania, Kazakhstan, Uzbekistan and even the rest of Europe. What is happening in Moldova? Moldova gets around 2,400 annual hours of sun but imports most of its energy from Russia. The country, a former Soviet republic, is considered one of the world’s most vulnerable when it comes to energy security. It also has a commitment to produce 20% of its energy consumption from renewables by 2020 as part of climate change commitments. To tackle these issues, the United Nations Development Programme (UNDP) is co-ordinating an imaginative scheme. It will see solar panels put on the roof of a university — enough to make it 100% powered by the sun. The installation and purchase of the panels will be bankrolled by the private sector — but not how you might imagine. 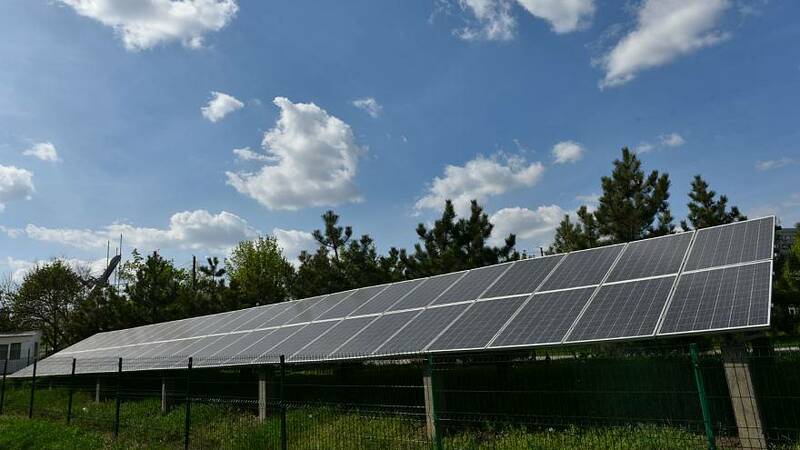 Individual investors from The Sun Exchange — an online marketplace where people buy solar panels and lease them out for use on buildings in Moldova and elsewhere — will fund them. How do the investors get their money back? The solar panels or cells are leased for 20 years and the investors are paid a fixed rate according to how much energy is produced. They are paid using the world’s best-known virtual currency, Bitcoin. They also get given another virtual currency, SolarCoin, as a reward for producing renewable energy. This can then be re-invested in other solar projects or exchanged for a traditional currency. The Technical University of Moldova, based in the capital Chisinau, is set to be the guinea pig for the scheme. The university had wanted to install the solar panels itself, but it lacked the finance or expertise. Dumitru Vasilescu, project manager of UNDP in Moldova, said the pilot project will help with both. He added the university’s lease payments to investors would not be more than what it pays out for electricity today. It will also get the solar panels at the end of the 20-year lease period. Where else could the scheme be used? The initial idea is that the solar panels are purchased for the rooftops of public buildings, like schools and hospitals. But, said Vasilescu, it could also be rolled out to residential customers. Vasilescu added other countries in the region, like Kazakhstan and Uzbekistan, could also be in line to benefit from the scheme. He also said there had been enquiries from organisations from Romania and that there was potential to expand it to other EU countries.